I asked the question on Facebook last week “Why is it such a struggle to read your bible?” and the responses blew me away! Honest, vulnerable, and authentic. I believe lies I’m too busy, when the truth is, I’m not making the most important thing the most important. To me it’s like the gym. Once you get in the groove you feel a need for it everyday, but as soon as you relax one day it’s so easy to get off track. The challenge I face sometimes is getting confused and not really having someone to ask what something means or how it relates to me, so I get discouraged. For me literally…my flesh does not want to! I feel like I often don’t understand it as well as I would within a study or companion guide. For me its fear… Fear that I’m not living by His word. The more I read the more I realize I need to make some changes. I don’t like to read in general and I’m reading chronologically right now. I’m in the Old Testament and I’m finding a lot of what I’m reading confusing or just depressing, honestly. The struggle to make it my first priority. I get distracted by “stuff”. Half the time I don’t know where to start. Squirrels” – meaning everything you feel you “need” to get done; i.e. laundry, cleaning, taking care of the family, working out, meeting with friends, work, etc. I’m not a natural student. AT ALL. Studying is not my favorite thing to do. It’s challenging and difficult. I dislike reading in general. I always have. I have comprehension problems which makes reading for me take longer than most. Getting lazy, not understanding something and feeling to embarrassed to ask. There is pressure to have these focused, study, journal writing, contemplative times, when for some of us, reading 1 scripture for the day and meditating on it is enough/worth it/pleasing to the Lord. It’s so big and there’s so much information, some of it being hard to understand, I get overwhelmed. I have a very hard time just BEING. My mind is always spinning with things to do, people for whom to pray, etc. I can’t quiet myself in order to focus on what I’m reading. I buy into the lie that I am too busy. The mere fact that I can see this on Facebook tells me that isn’t true. We have a million reasons that make this a struggle. Did you notice a theme? So, I immediately shut my computer and prayed. I realized that the devil is declaring war for the hearts of women and I won’t stand for it! If the reason we struggle to get in the Word is any one of these listed above, then I’m standing in the gap and asking you to rally with me. One of the most difficult ways to grow spiritually is by doing it alone. Friends, I was still getting drunk when I was going to bible study and you know why I went? I needed someone to show me a different life, I needed someone to ask me if I was still partying, and I needed others to walk with me, encourage me, challenge me, and help me. And I still need that. I need others to enter in with me and spur me on toward Christ. Today, if you haven’t already, confess why it’s a struggle. Can we just all say it out loud? It is a struggle to read God’s word and be okay with starting there? Being able to name the struggle is the beginning to healing and change. Name it! We need to do this together. We need our people. We need that friend who will encourage us, our life group to hold us accountable, and the mentor that will ask us hard questions. I hope this blog will become a little piece of that community. Let’s do this together, committing next month to reading daily and discussing together! You can sign up here to join us on this blog to read through Philippians together starting in August. We need Jesus. We need to preach the Gospel to ourselves daily. The issue is not necessarily a lack of time or understanding, it’s a lack of abiding. So let’s start with Jesus. Who He is, what He’s done for us, and what He empowers us with to walk with Him daily. 1. Read Ephesians 2:1-10. What is one insight or observation you had from these verses? 2. 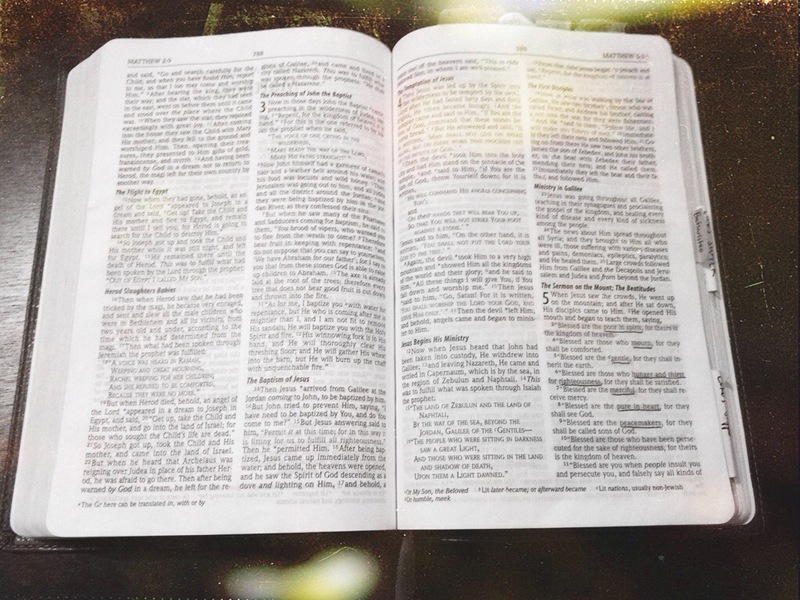 Is it a struggle to read God’s word daily? Why or why not? 3. What is one thing you can change today to help you abide in Christ? How do these verses encourage you in that? *Reflection can be done in a journal, in discussion with a friend, or leave a comment below to one of the questions. Check back tomorrow for more on why we read the bible and we can trust it’s true.